Visiting a graveyard is always a somber affair, the clouds in the sky lend an ominous cast to the environment and even the cawing of the crows sounds muted by the pall of death hanging over the landscape… At least, that’s how popular media says it’s supposed to feel, an irony that doesn’t escape me as I wander the Calvary Cemetery in the blinding sunlight bombarded by construction noises and the unintelligible shouting through a loud speaker from some event happening at the nearby University Village. Even the crows sound loud and cheerful and there’s a large, bright notice about an ongoing project to make more room in the graveyard. I am informed by the notice that this is “a wonderful opportunity for your family.” The tone of the notice causes me to feel that the person writing it had only barely restrained themselves from the use of an exclamation point at the end. Over the past couple weeks our Historical Archaeology class has been looking at gravestone typologies and the way society views and interacts with death. The specific graveyard we chose to look at is connected to a Catholic church which means that the stones are decorated primarily with crosses and other religious insignia. Upon breaking down the gravestones by date and type I found that most of the stones over the last hundred years have been fairly simple, mostly flat with some classic tablet style stones mixed in. Not every stone fits this category but enough to make it significant when looking at how we view death. The earlier stones are bigger and often more elaborately decorated implying that we are now honoring our dead in different ways. This doesn’t mean we care less simply that it has taken a different form. I also found that the number of deaths shown in the graves we looked at increased dramatically during the early 1900’s, with the most deaths in the 30’s specifically. When I went went looking for a reason for this I couldn’t find one in the historical record. Although this is within the Great Depression the sources I found actually indicated that mortality rates went down during that time and not up. This means that, rather than saying something about death rates, this likely says something about the rising and falling popularity of this specific church within the community as a place to bury loved ones. 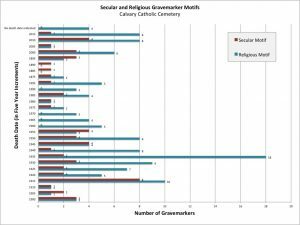 It would be interesting to do a further study and see if the number of graves at the nearest secular graveyard went up at the same rate the ones at this Catholic graveyard went down. This past week, we did a survey of a section of Calvary Cemetery in Seattle. The section I surveyed had graves from the early 20th century to now, and there was a very diverse variety of grave shapes in that section. My section also had many family plots from the early to mid 20th century, and only a few from the last 30 years, which seemed to be the overall trend in the graveyard itself. It was interesting to see how gravestone styles change over time – something you definitely don’t think about. For example in the early parts of the last century, monument shaped graves were pretty common, now, there are very few which are recent. I expected to see more differences in how the graves of women and men; there were differences, but they were much more subtle. On dual grave markers, the husband and wife are represented as equals, side by side, and both would say about the same thing, “Loving Mother, Loving Father.” If the man had served in the military, he would also be recognized for that – either in the epitaph, or a little metal insignia symbol. Quite a few were from WWII, and women played a huge role on the “home front” during that time, but I didn’t see any recognition on graves here – perhaps as they were not “officially” in the military, had no unit #, or formal type of training. Upon doing some research I learned that women were not fully in the military to train until 1976. Another difference I noticed was how the headstones of women tended to be more emotional than the men’s. Beyond the names, dates, and epitaphs, grave markers contain coded social information in their material, shape, design motif, and location in the grounds. I analyzed the religious and secular design motifs noted in our class data collection––comparing crosses, rosaries, other Christian symbols against professional and military emblems, personal hobbies, and other non-religious imagery––and saw some trends appear. Religious motifs dominate in the 1920s to 1950s, but there is also a steady presence of secular motifs in that window which drops off after the 1950s. Thinking geographically, burials during that time window were primarily in the northeast and southeast areas of the cemetery. In contrast, burials before 1920 were almost exclusively in the southwest and center areas, and were evenly balanced with secular and religious design motifs. Though our data are only a fraction of the graves inside the cemetery, they do suggest patterns in how the cemetery grounds have been utilized and how the dead and their mourners decorated headstones across time. Chart: Seriation of secular and religious design motifs in gravestones. Fortunately for historical archaeologists, there are lines of evidence like historical texts and photographs to inform on the social and cultural contexts of graves, beyond just shape, design, and location of headstones. Consider the charts below: could the increase of burials in the 1915-1920 window be connected to the Spanish Flu Pandemic? Is the rise in religious motifs during the height of the Depression years suggest people were turning more toward their religious communities and beliefs for strength? Does the decline in burials during the 1960s to 1980s reflect dissatisfaction among traditionalists after the controversial Second Vatican Council? Or did the Counterculture of the 1960s thin the church membership? Chart: Number of burials per five year increment. Chart: Geographic distribution of burials across time. These questions about major social change may seem far removed from the placid stone markers in the cemetery, but historical archaeology can begin to trace the connections between the dead and their past worlds. For our class assignment, we were asked to do a brief survey of the Calvary Cemetery in Seattle’s Ravenna neighborhood. 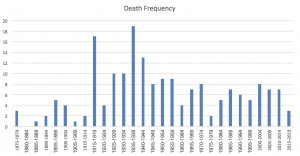 In terms of death frequency, the peak years were 1916-1960. Prior to this and after this period, in five-year increments, saw single digit plot usage. In and around war times, and for years after, you really see the importance that families have placed on military service and rank in male headstones. What this is telling me, based upon a small sample of the whole cemetery, is that by 1960, as the city began filling up, the space at this cemetery began to become a premium, and plot cost probably began to rise to more unaffordable levels. What you also see is a trend in headstones towards an in ground block style. The headstones also change in frequency of composition from marble and other materials to red granite becoming the dominant material. Of course, during the war years, especially during World War II, there was a strong trend of utilizing the bronze plated blocks that emphasized military service. Interestingly, there are no examples of women in service during this time, despite a documented War time record of women serving in various capacities during World War II. It would be interesting to explore this issue in an expanded survey focusing on World War II, Korean War, and Vietnam headstones emphasizing military service. As late October rolls around, bringing with it the Sleepy Hollow palette and a light chill to the air, it seems only fitting to do an exploration into one of the more spooky aspects of historical archaeology. 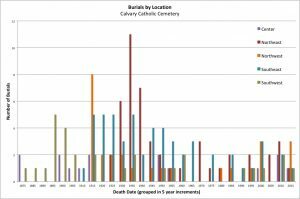 Each member of the historical archaeology was assigned a plot of the nearby Calvary Cemetery and took data on ~15-20 grave markers. As much data as could be derived was gathered including size, shape, material, epitaph, dates, form as well as many others. 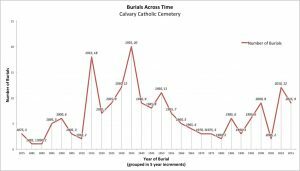 For this blog, I decided to look at frequency of burial for each 5-year period from the earliest grave marked to the most recent to see if I could find any trends. With n=224, we should expect the data to be representative of the cemetery as a whole, but given that there was no method to stone selection outside the initial assigned area, there could be some misrepresentation. That being said, there are a few periods that stand out. The first large spike in deaths comes in the period between 1915 and 1919- a time that coincides with one of the most deadly flu epidemics the world has ever seen: the Spanish Influenza. The most impressive spike comes during the late 30s, and as a recent transplant to the Western United States, I am not familiar with any epidemic or natural disaster from that time outside the Great Depression, though I don’t know how the depression affected death rate either. The general increase in burials over time makes sense just as a function of increased population, for even though life expectancy continues to rise, no one has beaten mortality yet. All in all, this was a very applicable look at how historical archaeologists interpret data, and it felt good to remember individuals who passed away years ago, and pay them respects once more. Our lab these past few weeks had us take data at a cemetery. We were sectioned off to record a part of the cemetery and take note of the inscription on the gravestones, whether or not it was part of a family plot, the size, shape, and material of the stone, and their age. It was sad to find some young children’s graves and even graves of those who were recently deceased. With all of the class’ data compiled, we looked at the frequency of shapes and how this changed over time. I found this difficult since more people in the cemetery had died earlier than the 2000s so the stylistic changes would not be completely accurate. Next, we were to choose from our seriation and to analyze one of three choices. 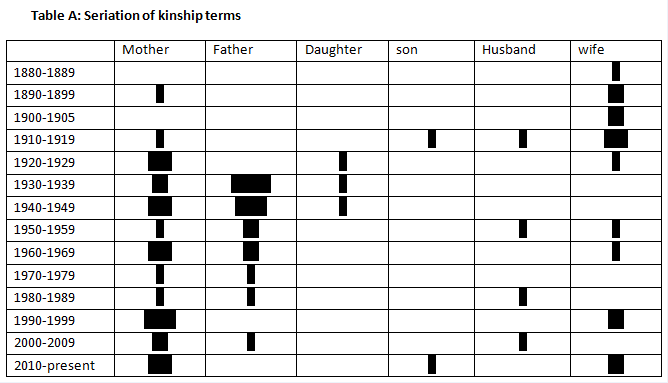 I chose to analyze the frequency of kinship terms. It was very broad to put into a graph, as not every single gravestone used a term of endearment. What I found was that many of the stones with kinship terms were female. There were almost 200 graves, and out of those 200 were around 50 stones that used terms such as “mother,” “father,” “sister,” etc. Out of these 50 stones, there were 32 with inscriptions “mom,” “aunt,” “wife,” etc. This could mean that maybe female figures were more “cherished” in terms of family and the home. The next thing I found particularly interesting. Earlier gravestones, from the late 1800s to before the 1930s used “his wife,” or “wife of”. 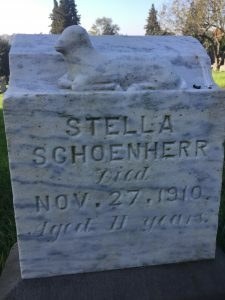 In around the mid-1920s, the gravestones from this cemetery used more “mother,” or “beloved wife and mother,” instead of being a man’s wife. I wonder if we would see this same trend if we looked at other cemeteries in the Seattle area. There was only one instance where they used “son,” and he was an infant when died. There were three other times where their daughters were referred to as “angels”, also in infancy when they passed. All three of these girls passed away in the 1960s, which raises the question as to what could’ve happened during that time that caused them to pass at such a young age (at zero months to four months old). Could it have been due to the environment around them? Could it have been because they were suffering from fatal birth defects? Either way, it would be interesting to see if there were different trends in another cemetery or to see if they were the same. I think it would also be fascinating to see comparative studies on cemeteries by region. Calvary Cemetery is a rather old one in Seattle and possibly has been here since its very inception. As I had imagined, the most common epitaphs and messages were things like Beloved Mother and Beloved Father and here and there a quote from the Bible, after all this cemetery used to be a Catholic exclusive one. Many were former veterans usually from World War II some of I. One individual was what I believe to be some sort of nurse or doctor based on the caduceus symbol on her marker. 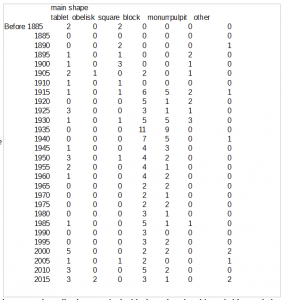 The seriation in my data was primarily focused on the type of grave marker used and looking at what kind of markers were most popular in each period of time over 5 year increments. 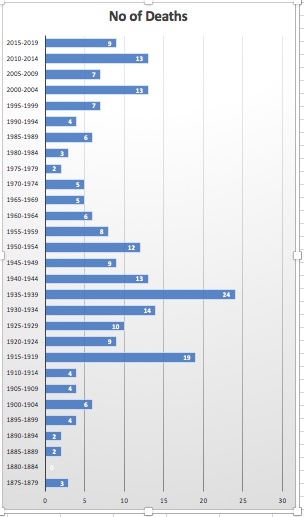 There were particularly many deaths between 1935-1945 in particular which coincided with the end of the Great Depression and American entry into World War II. This conclusion came from the fact there were so many small block markers, which were the vast majority of what I saw at the cemetery. Monument markers bearing multiple family members were at their peak in this moment as well. Based on the economy at the time, I figured that these were the most affordable options at the time based on the small size of the markers and sheer frequency. Monuments would have an economic advantage of being shareable by many members. Some of which I saw had no death date meaning that person was still alive and would be added later. There were relatively few veterans from what I expected but it is possibly they were mainly in veteran cemeteries instead. It should also be noted that most of these vets survived the war. A larger portion occurred the depression and were possibly because of illness and age. So what can you learn from a graveyard? Cemeteries. Typically seen as dark, depressing places continuously shrouded in rain, not really the place you’d want to do a study at. However, that is exactly what we did. Through the examination of the features of headstones, such as epitaphs, shape, size, material etc. cultural norms from various eras can be inferred upon. One aspect of this that intrigued me was the use of kinship terms. Through my initial observations it seemed more often than not terms such as wife or mother were being used on female gravestones, while terms such as father were almost absent. To create a clearer image of this I created a seriation based on the use of kinship terms overtime: The seriation demonstrates a clear disparity between the use of ‘wife’ and the use of ‘husband’.The term wife is most commonly used at the end of the 19th and beginning of the 20th century. During this same time period the term husband is rarely seen. This could be a result of societal norms which placed greater importance on the marital status of women than it did for men;women who were not married were seen as societal outcasts, while men were seen as bachelors. This would explain why it was thought necessary to define a woman by her husband. We encounter a similar trend when we look at the use of mother and father. Between 1890 and now mother is almost continuously used on head stones. In contrast, father is not used until the 1930s and even then we do not witness a continued use of the term to the present. This indicates that it was and still is thought that the relationships in a woman’s life, particularly that of a mother and child, are of great importance to their identity, while the identity of men are better represented by their name. The terms daughter and son were uncommon. I cannot see any discernable trends in the use of the two terms over time. The few headstones that did have daughter and son on them were child graves. From this I am assuming that the only time these kinship terms were used was when a child died before their parent. Well that’s all for now. If you’re interested in learning more about this particular topic I encourage to pop down to your local graveyard and make note of the kinship terms used over time. Analysis of cemetery gravestones can yield interesting information about ongoing world events and general trends in religious behavior and burial practices. Charting the frequency of burials that our class surveyed reveals two peaks in death (Figure 1). One of the peaks around 1918 corresponds with the Spanish flu, a worldwide epidemic that caused millions of deaths, including many in the US. Another peak in the late 1930s, early 40s is likely associated with World War II; some of the gravestones from this period list the military affiliations of the people buried. Most of the gravestones placed during these peaks were the block style (Figure 2). Due to the large number of burials during these time periods, the cemetery was probably rapidly expanding and thus the number of very large monumental gravestones and plots decreased. The block style gravestone takes up less space than some of the other stone types and more people could be buried in a smaller area. 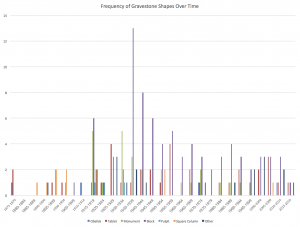 Though our sample size was small, it was still revealing of world events and trends in gravestone styles. I imagine that an even larger survey size would reveal a more refined view.